LonWorks gateways are used to connect Modbus or BACnet devices to a LonWorks network in a manner that makes those devices behave like a LonMark certified sensor or actuator. The Babel Buster LonWorks Gateways themselves are LonMark Certified, based on the LonMark sensor and actuator functional profiles. The gateway’s implementation of sensor and actuator simply leaves the door open for you to define what the actual sensor’s and actuator’s physical hardware consists of. The LonMark Certified Babel Buster gateways are intended to be commissioned on a managed LonWorks network using a commissioning tool such as Echelon’s LonMaker or other equivalent tool. Network variables are bound in the traditional manner. 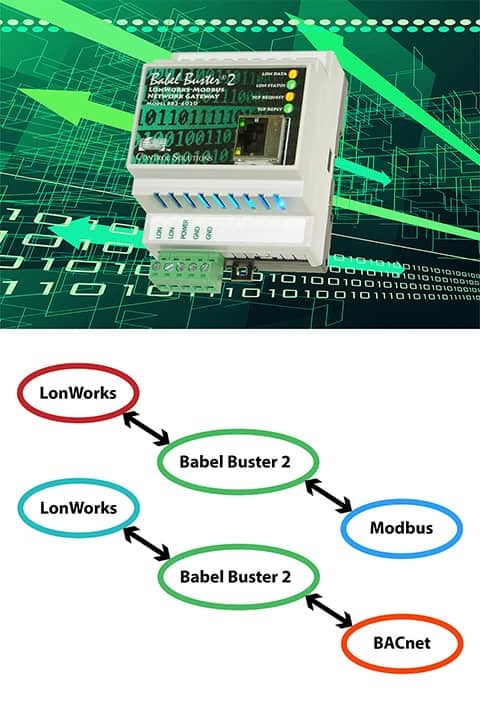 Using the Babel Buster gateway, you are effectively binding Modbus registers or BACnet objects into the LonWorks network. Data flow will function according to the network variable direction. Control Solutions’ product line also includes models for connecting LonWorks devices to Modbus or BACnet networks where Modbus or BACnet are the primary network rather than LonWorks. The Non-Bound LonWorks gateways let you select network variables from LonWorks devices that will be polled by the Babel Buster gateway. The polled data is placed into (or taken from) Modbus registers or BACnet objects. The gateway can act as a Modbus slave or BACnet server. In addition, the gateway can function as Modbus master or BACnet client, actively polling Modbus or BACnet devices at the same time it is polling LonWorks devices, sharing data in both directions. Babel Buster®... The LonWorks Gateway Brand Everybody Remembers.